One of the workshops we attended on Sunday was led by Pak Irianto Ryan Tedya. It was a very enjoyable workshop with songs and games, 2 of which would be ideal as a brainbreak or for TPR. Hands down wards, palms facing opponent. Pak Irianto asked us to play 3 times with a partner and then swap partners choosing someone new. When he judged that we had mastered that, he asked the whole class to synconize our games; meaning that the entire class clapped & said dam, dam, sut at exactly the same time, starting very slowly and encouraging everyone to keep the rhythm. All up, it was a fun game and I loved the way that the game increases in complexity which makes it appealing to all ages of students. The final activity he did with us was awesome and perfect for TPR. This song could be adapted to any verb. I love the idea of asking students for action suggestions!! I was thinking of how much fun ‘menangis’ (cry) or ‘jatuh’ (fall) would be. Pak Irianto first taught us the song and actions then suggested adding the jumping left, right & centre afterwards to add a further challenge. I didn’t take any notes, just this video!! Over the weekend, Bu Annie, Ibu Sharon & I attended 2 conferences; 1. MLTASA (Modern Languages Teachers Association SA) in the morning and 2. CLTASA (Chinese Language Teachers Assoc) in the afternoon. 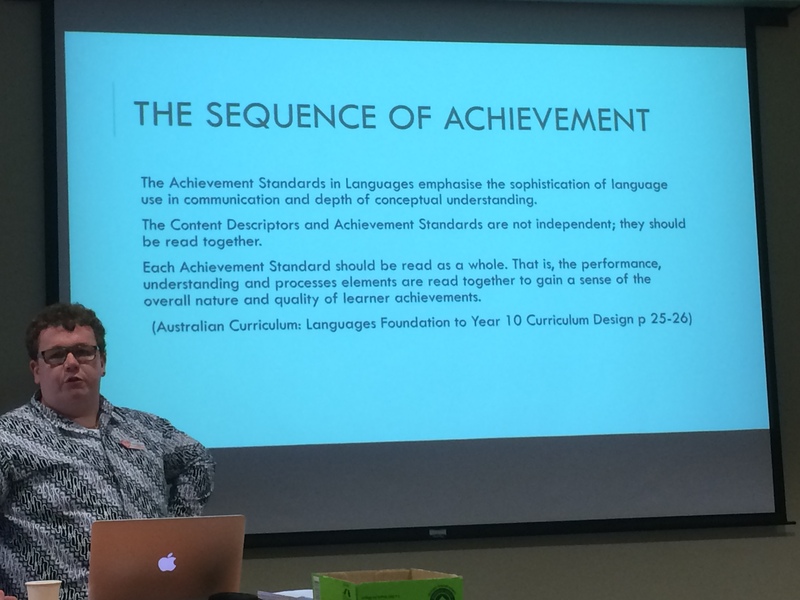 When we first heard that both associations were holding their annual conference on the same day, we were incredibly disappointed as we were committed to present at MLTASA while Ian & Caitlin (2 TCI Chinese teachers from QLD) were presenting at CLTSA. Luckily our presentations did not clash and we were able to get from EDC to Napier House in good time. However the locked door into Napier House cut short our celebratory hand pumps and thankfully Ian had his phone on! The MLTASA conference began with a plenary by Sean Keenihan, who spoke about ‘the role and value of Languages education in schools – a business perspective’. Sean wears many hats and most relate to his Chinese proficiency, dating back to his high school days. When asked how to encourage students to learn a language he reflected with this: after graduation as one of hundreds of lawyers, he was the first from his year to be employed and this was entirely due to his bilingualism. His graphs illustrated recent growth figures in the SA tourism sector and he also talked about the growing state of global business. These two sectors are a just 2 of many that have a huge and growing demand for bilingual employees and thus being bilingual is giving many job seekers an X factor, making them highly desirable in a competitive job market. Apparently only 30 of the 700 2015 SA lawyer graduates were employed! I wonder what their X factor was? Our workshop, ‘Teaching Languages with TCI/TPRS’ was to be held in the larger room at EDC due to the large number of participants who had signed up for it. What an awesome way to begin!! We began by asking participants to bring their chairs to the front of the room and to sit in a semi circle facing the screen. As this was our first ever presentation and indeed our first ever attendance at MLTASA, we had no idea what to expect. One thing we were looking forward to was an audience of largely non Indonesian speaking teachers, who would experience our demo lesson from a student perspective and therefore hopefully feel the power of TCI even more dramatically than our Indonesian speaking colleagues. Our presentation began with introducing ourselves, outlining our TCI journey, and giving a brief explanaton of the acronyms TCI, TPRS & TPR. Due to the short amount of time we had available and that we were a little late starting (domino effect of the 2nd plenary speaker running over time), our introduction was minimal. We felt that a demo would be more powerful than heaps of information. Our demo focused on the Pleased To Meet You (written by Jim Tripp) story. We began with establishing meaning of the target structures (siapa nama, nama saya, astaga, berkata – what’s your name, my name is, OMG, said), before giving a circling demo on siapa nama & nama saya. Sharon then established the ‘Stop – I don’t understand!’ gesture before telling the story. Afterwards she did a comprehension check and everyone gave her a thumbs up!! We had a little time for questions and we were very relieved that attending MLTASA was a high school French TPRS teacher!! It was awesome to connect with Zelda who has been working alone for 2 years – we take our hat off to you! 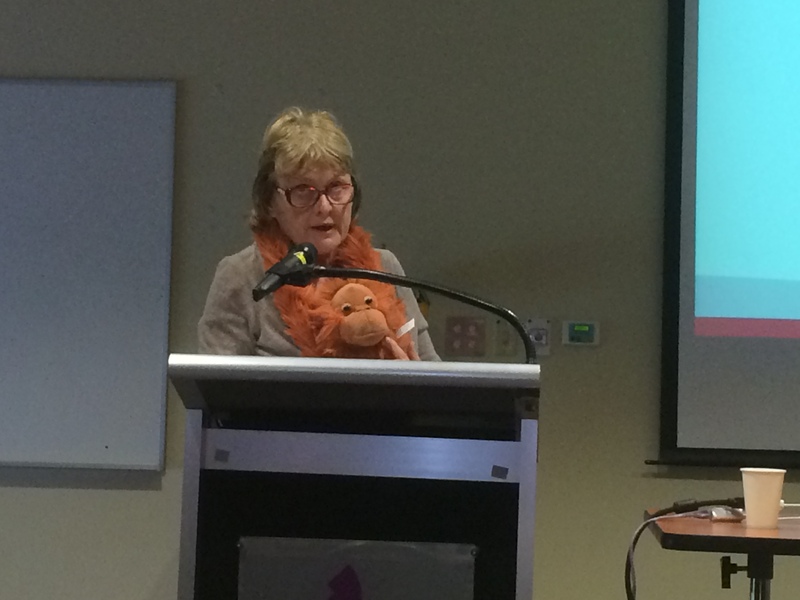 Zelda was able to respond to questions that came from secondary language teachers – a cohort we have had the greatest difficulty connecting with as we have no secondary experience. Our promise to them that TPRS was designed initially for secondary students by a secondary language teacher rarely helps. Zelda’s contribution and support was invaluable. It wasn’t till much later, that Sharon realised that in our nervousness, the reduced workshop time and our determination to leave punctually, we forgot to mention anything about the unit of work we had created around this story to help participants trial a unit in their classrooms!! Oops. So if you were one of those participants and you would like a copy, contact me via my learn link address on the handout and I’ll happily forward it to you. We arrived at Napier House just before the post lunch conference sessions were about to begin, to our relief. Ian & Caitlin opened the locked doors which gave us time to quickly introduce ourselves to each other and chat briefly while heading upstairs to the auditorium. The entire afternoon schedule had been assigned to Ian & Caitlin! Imagine your only time constraint being getting to the airport in time for your flight home! We were slightly in awe and also a teeny (OK- a lot) envious!! Maybe next year, we need to ask for a double workshop session? Ian & Caitlin spent the first hour talking to a powerpoint which introduced TCI/TPRS to their audience of Chinese teachers. The powerpoint thoroughly explained TPRS, outlined how it differs from traditional/currrent language teaching methods, included several short videos of Ian teaching highly engaged year 7’s, year 10 free writes (290 words) , cold character reading , students talking positively about learning Chinese via TCI methodology, students reading unfamiliar texts fluently and a short yet highly engaging demo by Caitlin establishing meaning for ‘wants to eat’. As a student, I could immediately see the value of having the target structures clearly written on one side of the smartboard page and on the other side were other necessary vocabulary just as Diane Neubauer does.I hadn’t actually understood the beauty of this until that point! I also think I need to investigate buying a clicker gadget next year – it would be so convienent to turn the powerpoint pages from wherever I am in my class room! Ian & Caitlin stopped talking after an hour to give everyone a break and they were immediately swamped with people asking questions! The amount of interest was brilliant. During their presentation, I could hear teachers around me commenting to each other quietly but unfortunately it was all in Chinese. During this break, it suddenly became clear, that the next session would have to be shortened significantly to prevent Ian & Caitlin missing their flight home to QLD. Particiapants were quickly called back into the auditiorium to answer any last minute questions. In no time at all, they were being presented with bottles of SA wine and the mad dash to the airport began. Thankfully we had offered to take them to the airport as this provided us all with a precious window for solid 2017 planning. We all acknowledge the need to arrange high quality training in Australia asap and are keen to collaborate on this by inviting a guest out to Australia next January to provide us all with much needed expert training before the 2017 school year begins! It would be awesome if the person who comes out, is happy to travel as then we could offer training in a few states which will be much more affordable to participants! If this all happens, would you be interested in attending and how much would you be prepared to pay to participate? Considering our only option at the moment is a flight to either America or Europe ($$), it would be considerably cheaper and so much easier if this eventuates! Please comment below with any thoughts. We need your feedback! The more interest, the better! While traveling last holidays, I recieved an email from CEASA confirming my nomination for an award and inviting me and 2 guests to attend. I immediately added the date to my diary and began wondering what does one wear to a cocktail party? 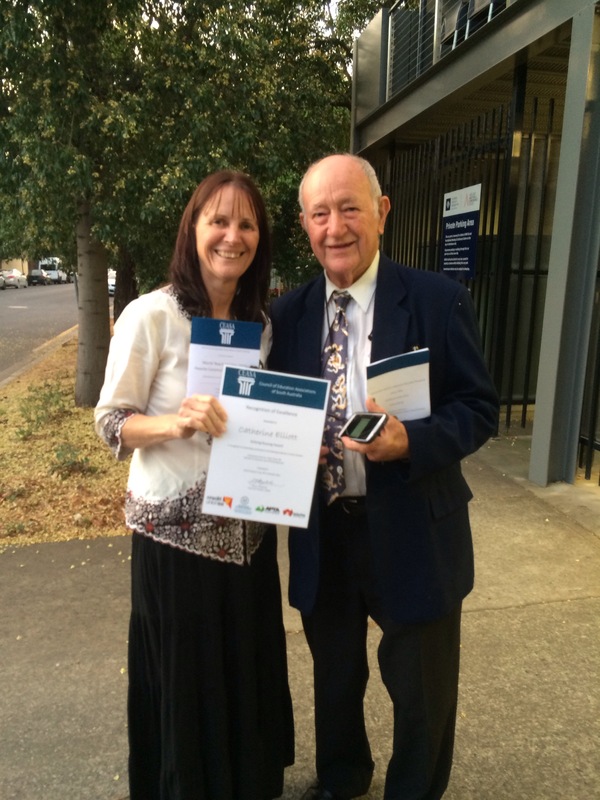 I was so pleased that Brenton had included this information because when I spoke to my Dad inviting him to attend, he asked me why I’d been nominated and I realised I didn’t know! I was just so chuffed to be nominated, the why hadn’t occured to me! So you can imagine my distress and disappointment when I woke up Friday morning severely unwell. I rang my Dad in tears and after quizzing me on my symptoms (viral and not flu was his diagnosis), he recommended paracetamol and bed rest. I did as he said and woke several hours later feeling that the hour drive to Adelaide was now manageable. I got ready, packed an overnight bag and headed off. I got as far as Port Noarlunga and just had to stop. I was sooo tired and all I wanted to do was put my head down. I debated briefly with myself and decided that it was better to keep going and have a decent nap on my arrival into Adelaide. It was the hardest drive I have ever done. I finally arrived at my daughters flat where she took one look at me and put me to bed. She woke me an hour later and we headed off to collect my father, who it should be mentioned, usually avoids sick people like the plague!! (ha ha) It is a testiment to how proud he was that he accompanied us at all. The award ceremony itself is a blur. The room was set up with chairs facing the front lectern. The front chairs divided in half with one side for award recipients and the other for important guests and award presenters. The back section was for invited guests and that is where Dad & Bec sat with my phone to photograph the action and atmosphere. I sat in a row of 5 people and felt very rude not talking to them but I was so conscious of being contagious. I later realised that I had spent the morning castigating whoever had shared this virus with me for daring to step foot outside their front door when so ill and here I was doing just that! I really hope I was able to keep my germs to myself that evening! Sonya Feldhoff (891) was the MC and she did a stirling job. After short speeches by various stakeholders, the awards were presented smoothly and swiftly. One by one, each row of awardees was invited to stand and wait in the ‘wings’. 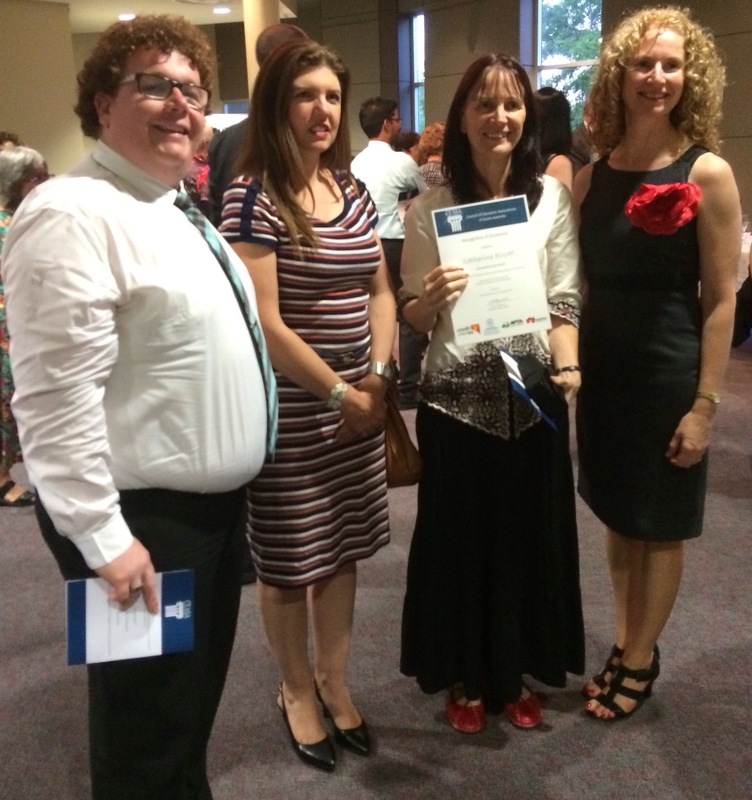 As Sonya read out our name, we walked across the ‘stage’ to Susan Close, the Minister for Education and Child Development, who was ready to present us with our certificate. Together we then turned and faced the cameraman who was sitting in the front row and then in front of everyone, smiled with the certificate front and centre. I was able to do all but the smile, and I am dreading receiving my official photo because my face just would not cooperate! I returned to my seat and spent the rest of the evening alternating between struggling to keep my eyes open and checking my watch. It was with great relief that the ceremony finished half an hour earlier than scheduled. I quickly searched for Dad & Bec who were enjoying a glass of red. They took one look at me, put their glasses down and we turned to head down the stairs. Going against the throng who were heading for the promised food and drink, we ran into Brenton, Julie & Andrea representing INTAN. They begged for a photo before we headed off and I was grateful for that because I too wanted one yet was uncomfortable about transmitting my revolting virus to either the president, the vice president or the secretary of INTAN who had so generously given up their Friday evening to witness the ceremony. I sincerely hope my zombie-like state and early departure in no way interfered with their enjoyment of the evening!! 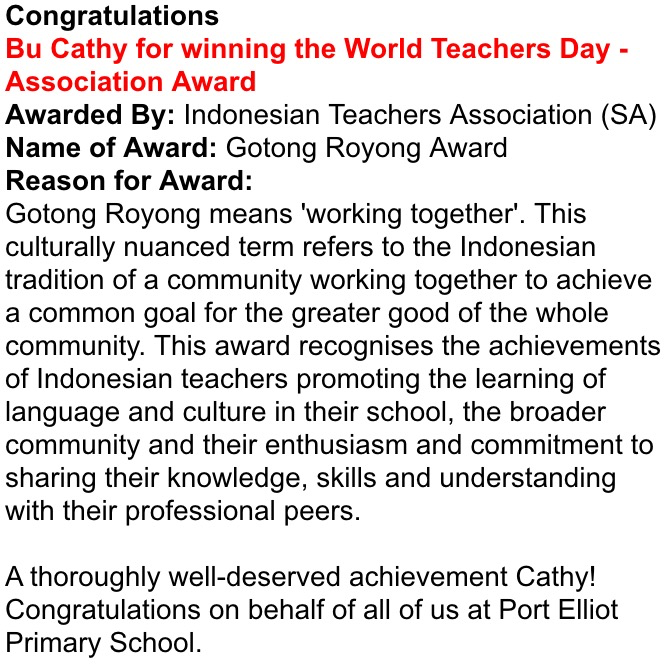 Thankyou INTAN for nominating me for the 2015 Gotong Royong Award. It was such an honor to receive this award and I am truly humbled to have been acknowledged by such a wonderful organisation. 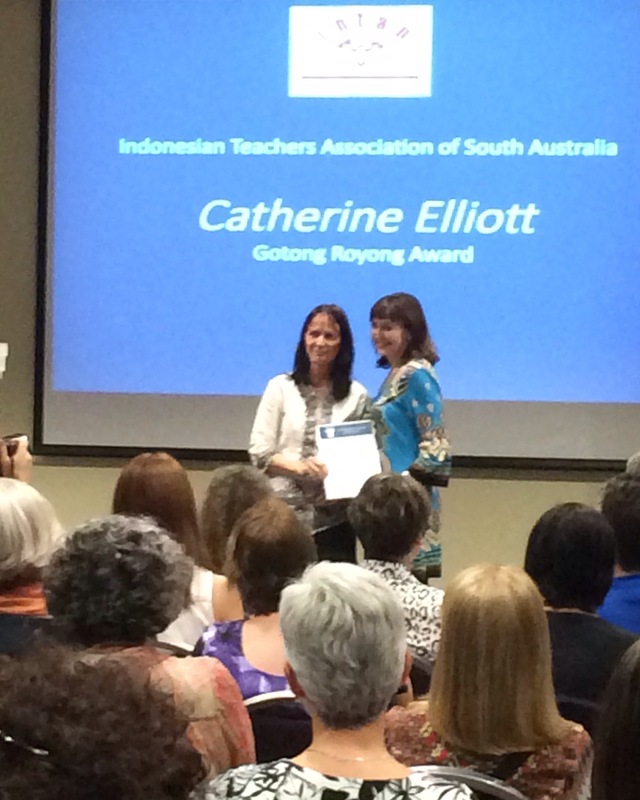 Receiving the award has helped me realise just how lucky I am to have a job which incorporates my two passions – TPRS and Indonesian. Terima kasih sebesar besarnya teman teman di INTAN. Language Perfect poster – world championship in 2016!! Offering $25,000 prize money – well worth investigating!! Amansar journeys of discovery and learning flyer – hopefully soon our short sighted state government will realize the extent to which they are short changing language programs by refusing to sanction school trips to Indonesia. In the meantime, I look at this flyer and imagine a future where I can travel with my students to Indonesia…. Asia Bookroom booklet – particularly interested in the ‘Our Jakarta’ series. Are they anywhere near the quality of the amazing books printed and published through Dyatmika School??? Lote Teaching Aids – catalogue, pen, keychain, bookmarks and sticker selection. Not bad hey? Bagus kan? After Brent informed us about the location of the amenities and the evacuation procedures, he welcomed Uncle Frank Wanganeen to welcome us to country. Uncle Frank spoke briefly about his contact with his language – the Gana Language and his country – Narrunga. He told us that he had grown up in Adelaide during a time when there were unpleasant consequences for those heard speaking in the Gana language. Consequently it wasn’t till he was an adult that he could learn Gana. In the 1980’s there was a conscious movement to revive Aboriginal languages and today there are many resources available specifically aimed at teaching and learning Aboriginal languages, including YouTube videos!! Uncle Frank then acknowledged his ancestors and welcomed us to the land upon which the conference is being held both in the Gana language and in English! A beautiful start to our conference. I always find the welcome to country moving. 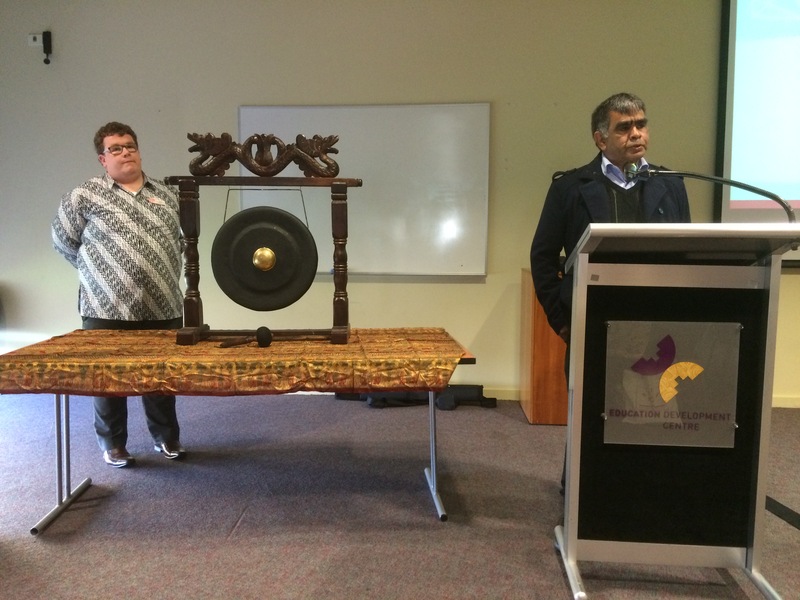 After Barbara Hatley was invited to officially start the conference, Brent outlined all the reasons why the Intan conference is highly valued amongst Indonesian teachers. These reasons include the ability to collaborate, network, for professional development and to discover useful resources. Brent next officially launched the Intan website and outlined a Treasure Hunt competition cleverly designed to motivate us to investigate the website. 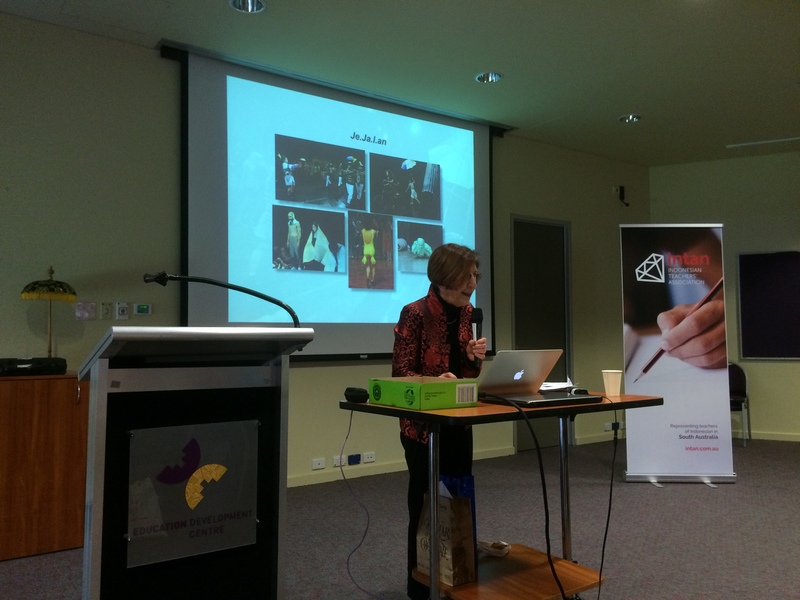 He then again introduced Barbara Hatley from the University of Tasmania who spoke about the role of theater and drama in Indonesian society both historically and in the present day. It was a fascinating presentation including photos and video snippets of a group called Teater Garasi who will be performing in the OzAsia Festival. Aren’t they seriously bagus banget??? Overall the feedback we received afterwards was incredibly warm and encouraging. Following immediately after our session was lunchtime, which we gave us some extra time to chat with those who had more questions. Excitingly for me too, I got to meet 2 of my followers, one of whom has also been trialing TCI in her classroom!! Lovely to put faces and names to a few of my followers!! We were all treated to a delicious lunch where the carnivores could choose between rendang and ayam goreng while the vegetarians enjoyed tempeh, cap cai and pecel – all served, naturally, with rice. After this feast, we next could choose to attend a further selection of workshops. Sharon, Annie & I divided ourselves again between Brent’s workshop on assessment and evaluation and Daniel Bradbury’s Number workshop. Brent’s workshop began with a focus on the aims of the Indonesian Curriculum. I understand the first 2 aims and agree they are important aims for a language curriculum but have difficulty getting my head around the third. I need to research it in order to understand exactly what it means and then hopefully it will be clearer as to why it is listed as one of the overall aims. Personally, I feel that it should be in the health curriculum!! What do you think??? Brent then shared with us how he has identified each and all of the Achievement standards and demonstrated how they all link back to the content descriptors. He also shared with us several items developed by staff from his site. These include a very detailed rubric that his school site has put together which they use to grade student work, a suggested F- year 2 curriculum demonstrating how thematic units of work can be devised to achieve curriculum objectives. The conference finished up with short presentations from various groups. 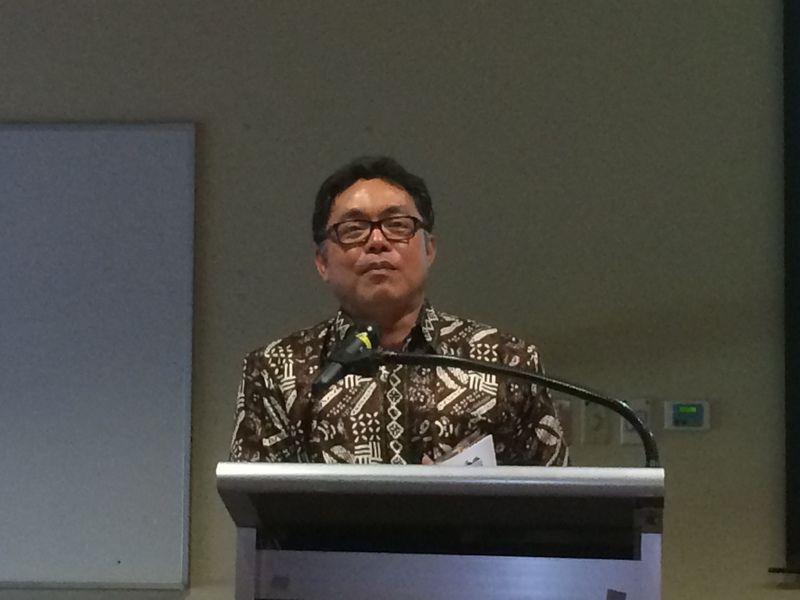 Pak Budi talked about the Jembatan project which aims to build bridges between Indonesia and Australia. He mentioned that in 2016, 2 internships will be available. Must keep that in mind!! Chris from Indofest very kindly interrupted his tennis game to speak to us. Indofest, an annual Indonesian festival, has been running since 2008. It is usually held earlier in the year in Rymill Park however this year it will be held on October 5th in the Migration Museum, Art Gallery, State Library, SA Museum precinct and most importantly, there will be free parking in Adelaide all day long. Helen Munro from The Orangutan Project (TOP) spoke. She is the current education officer and is available to visit schools. A variety of programs are available and can be designed to complement a variety of topics and age groups. 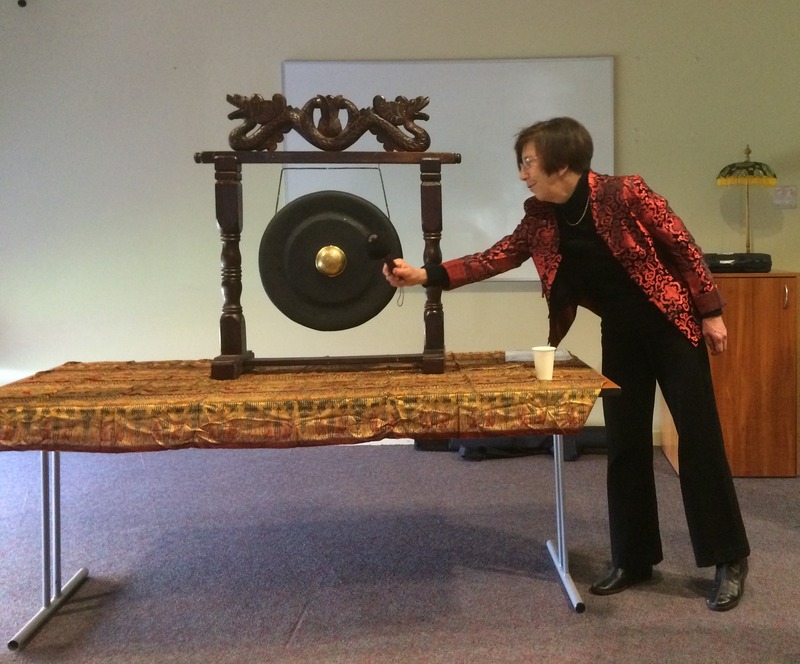 Jodie Edwards reminded us about the OzAsia festival which will be held the day before Indofest. This year it includes several exciting Indonesian performances. Rosslyn Oldfield encouraged us all to get together with our hub groups. Hub Groups are support groups for teachers and are an informal gathering for teachers to support each other and learn from each other! Just like a teachmeet. There is definitely interest for a hub group meeting on the Fleurieu, so we asked people to nominate the best week day and have tentatively organised our next meeting to be in week 5, term 4. The conference finished up with the drawing of the raffle which is always lots of fun as there were over 25 prizes!! First prize was generously donated by Amansar Travel and Diane was extremely thrilled to win a prize which included various day trips in and around Malaysia. A huge thank you to the brilliant Intan committee and hats off to acknowledge that yet again, the conference was highly successful. So: yes Brent; it definitely did meet our expectations! Last Friday, Sharon, Annie & I were again fortunate to have the opportunity to workshop with the marvellous Catharina, an experienced junior primary TCI practitioner. Due to South Australia leaving summer time and the USA beginning summertime, we met at 9am Friday morning (Aust) and 7:30pm Thursday evening (USA). Catharina’s school year is coming to an end, just4 weeks left of the school year, so we doubly appreciated the time Catharina gave us! Such an exhausting time. Last Friday, we were also joined by Rosslyn from INTAN. Rosslyn is the 2015 (and inaugural) INTAN hub group liaison officer and joined us to see what our hub group gets up to!! Jaket Pak Hudson terlalu besar. In my case, I had focussed on the target structures of perempuan & laki laki with my junior primary classes. 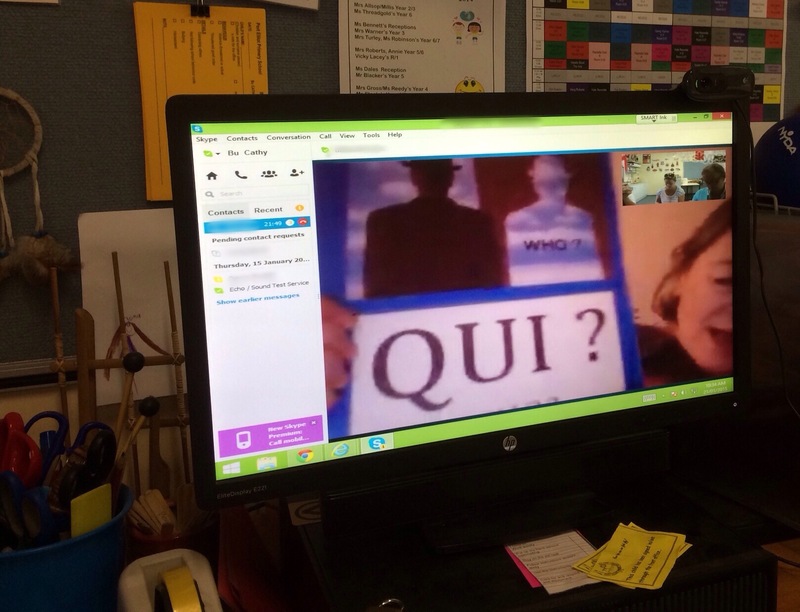 I once gain used the laminated PQA cards recommended by Catharina during our very first skype workshop. These A4 laminated cards include 2014 school staff photos as well as a few well known identifites like Batman, Spongebob & Harry Potter. I revisited ‘Siapa nama’ as well as asking, “Batman laki laki atau perempuan?” At the end of the lesson, I did a quick listen and draw using the brilliant clear folders. I also incorporated some TPR into the lesson because one of my term goals is to increase student acquisition of classroom instructional vocabulary (sit down, stand up, turn off the lights, sit in a chair etc). We began with duduk, berdiri dan putar and the instructions included sentences such as, “Laki laki duduk’ & “Perempuan berdiri dan putar.” If time, we played a quick game of Simon says (Bu Cathy Berkata) which they all adore and constantly beg for! Duplo – Have a big pile in the middle of the student circle. Retell the story the class has been working on, sentence by sentence. If the sentence given by the teacher is correct, students may take one piece of duplo from the centre pile. As they collect and listen, they can start building something using their peices of duplo. If the sentence given by the teacher is incorrect and the student took a piece of duplo from the pile, they not only have to return the piece they just took but also get a penalty and have to surrender one of their other pieces too! When retelling a story, have the whole class join in with the acting. All students are allotted one of the characters in the story and they each act their part during the retelling. TPR – When playing Simon says, give students lives so that they remain involved and continue to respond to the directions rather than sitting out. Don’t forget to trick students by purposely doing the wrong action! Throwing & catching a soft ball when asking specific students questions. Allows teacher to differentiate. Take photos of students acting to be used later for revision, discussion and retelling! Look at the Youtube video Valentines Day – perfect for movie talk. Great brain break is to act out the alphabet! Students using their whole body stand up and make each letter of the alphabet while saying each letter. This would be great for familiarising students with the different sounds made by the Indonesian alphabet. Catharina presents to each student at the end of each school year, a 1/4 sized A4 book which she has put together herself containing all the stories they have covered through the year! The stories are illustrated with student drawings that she has collected throughpout the year. What a great way to encourage students to read and continue having contact with the language over the holidays. 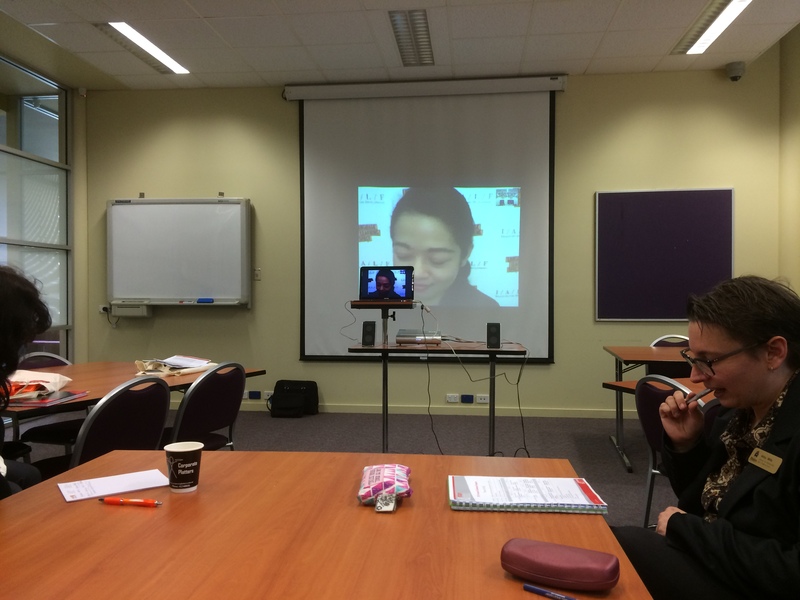 While our skype workshop was only for 50 minutes, we got so much from it. We then moved to a spare classroom to talk to Rosslyn. We gave her some basic information about TPRS/TCI as well as outlining our other collaborative projects. We look forward now to reading her article which will be published in the next INTAN newsletter! My hope is that we can tweak teachers interest in TCI! If you too are interested in learning more about TCI, see this previous post. A couple of Sundays ago, three Indonesian teachers from the Fleurieu Indonesian teachers Hub Group met with Andrea Costen, an Indonesian teacher currently working in 2 Adelaide High school settings. The 3 of us have, for varying reasons, been impatient to begin our investigation of the Languages Curriculum and therefore have been planning this meeting for months. While INTAN has/had a curriculum forum planned for later this term, we invited Andrea to come and give us an introduction beforehand and now we are so glad we did. We met at one of our homes which was lovely because while we were learning, we could listen at times and lift our eyes to the beautiful grounds and views that surrounded her home. It was a glorious day, and the view simply was the icing to the cake and just added to the discussion that was happening inside. 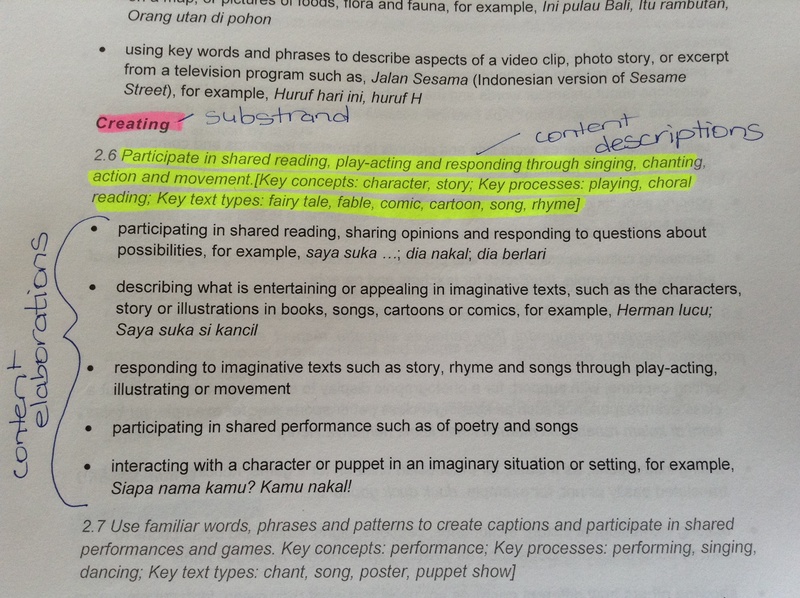 We each had a copy of the revised draft Australian Curriculum: Languages Indonesian.all 93 pages of it! I had forgotten that it actually includes 2 pathways and we only really needed the first – Foundation to Year 10 Sequence however it was valuable to also have a copy of the Years 7 – 10 (Year 7 Entry) Sequence too and understand where it fits in! We began the workshop by peppering Andrea with questions mainly about programming and other nuts and bolts aspects of applying the curriculum in the classroom. With 2015 looming fast, we explained our urgency. All 3 of us will have or have had significant amounts of leave over 2013-2015 and we each are concerned about the resulting gaps which will impact on its application and implementation in the classroom. However Andrea immediately put us at ease by informing us that it was recently brought to her attention that 2015 has been identified as being a year of familiarisation and at this stage the Languages Curriculum will not be mandated until 2016. Music to our ears! Andrea next introduced us to the language in the curriculum, the layout and illustrated her points with examples from her own teaching. It was so inspiring. We began our journey through the Languages Curriulum at the very beginning with the Band Descriptors which describe the learners. Content Descriptions are the compulsory and required content elements whereas the Content Elaborations are purely illustrative suggestions. I emerged from the workshop busting with enthusiasm to trial some of her ideas the following week! I also emerged with pages and pages of notes which I will edit and include because I am hoping others will find them interesting and thought provoking too. ‘Identity’ is a concept underpinned throughout the entire Curriculum. This helps remove the ‘strangeness’ & foreignness’ from language teaching which in turn increases tolerance. Teachers use language & culture ‘hooks’ to connect their students. Intercultural teaching is big picture thinking and not the 5 F’s. It promotes deeper thinking and understandings. Instead of having a set task for each class to complete to represent and measure the learning covered during a term theme, could we at the primary level instead pose an inquiry question based on what teacher and students believe to be the most important understanding we want to know as a result of the term theme? For example, What role does schooling play in the community? Or, How do we take care of ourselves and others? How do we promote good health? Language teaching should be about encouraging thinking rather than about providing answers. This can be achieved by asking students about what we need to know and then listing the points which can then be ticked off as they are each covered. It could also include asking students to contribute to the list of key vocabulary to be introduced/revised. I love this idea. I do begin each topic with a list of vocabulary which is often targeted through flashcards and games. I have in the past simply added any student initiated words however I realise that this in itself demonstrates how teacher centric my teaching is. This is going to be extremely challenging for me with my current stye of teaching yet also very exciting and leads perfectly to my next dot point. In learning about the new Languages Curriuclum, Indonesian teachers should play with the shift in thinking rather than in the shift in programming. The shift is in pedagogy. Know your students. Andrea gave examples of how she had surveyed her students to discover what other languages they had learned or already spoke. This is definitely something I would like to investigate further with my students. I asked my upper primary classes the following Monday about this and discovered that not only did we have students who spoke Punjabi and Greek, but one of our recently returned students from the APY lands speaks Pititjantjara! That was very exciting because a group of Year 6-7’s are currently preparing for a 10 day school bus trip to the AYP Lands! It also gave students the opportunity to consider what level of fluency gives you the right to say you speak a language. Being able to say “Aloha” does not make one fluent in Hawaiian! 1. Look at the ACARA website and familiarise ourselves with it. Look through one of the subject areas and explore how everything is set out because that is how the Languages Curriculum will be. 2. Design a profiling tool to get to know our students. Andrea shared hers, a survey she asked all students to complete. 3. Look at the achievement standards and look at how they are sequenced and build in complexity. Once again, a huge thanks to Andrea for meeting with us down here on the Fleurieu and providing us with so much information on the revised Curriculum- Indonesian.